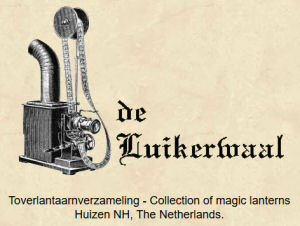 A Miraculous Exhibition of Real Magic Lanterns and Other Optical Public Amusements. 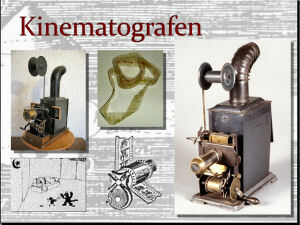 A Miraculous Exhibition of Real Magic Lanterns and Other Optical Public Amusements. 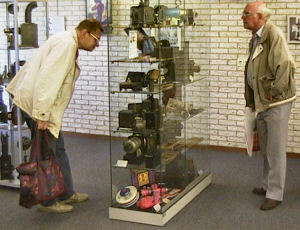 That was the bombastic name of the exhibition in the Public Library of Huizen, the Netherlands, during September 1999. 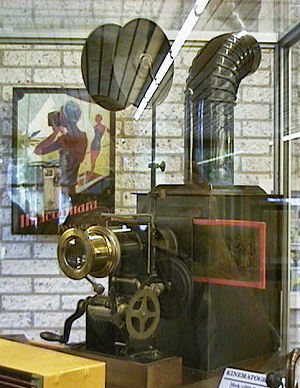 A bombastic name, after the fashion of the days that the magic lantern was a great source of entertainment and lanternists crossed the country to give their stunning performances on fairs and festivities. 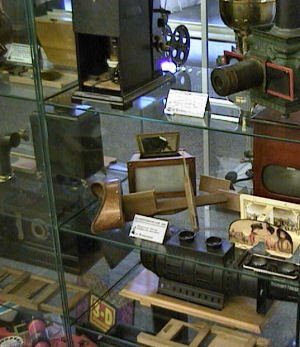 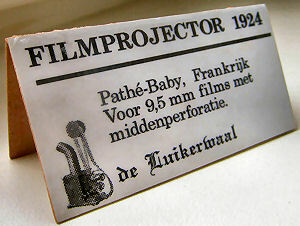 Besides old magic lanterns also the first projectors were shown, like the Pathé Baby, suitable for 9.5 mm films and the first 8 mm projectors from Kodak. 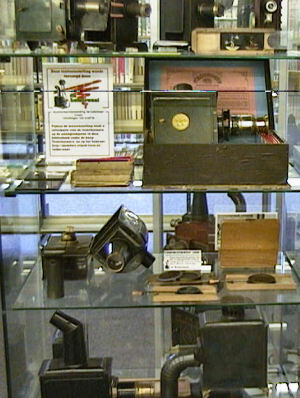 Furthermore various stereo viewers for three-dimensional photographs and slides, all kinds of light sources and modern optical toys. 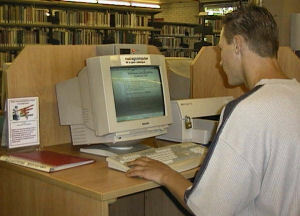 In the library room visitors of the exhibition could consult the Luikerwaal-website at the computer. 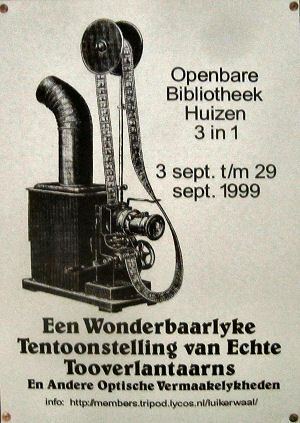 Right: An explanation board and a business card with the first logo of 'de Luikerwaal'. 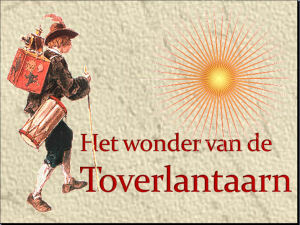 That was the first exhibition of the collection of 'de Luikerwaal'. 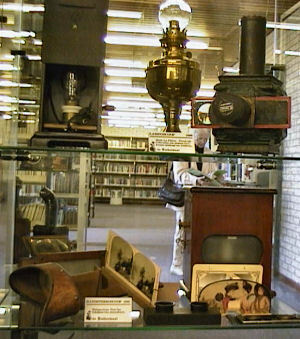 After that one, several exhibitions followed, in libraries, community centres, nursing homes and other public buildings. 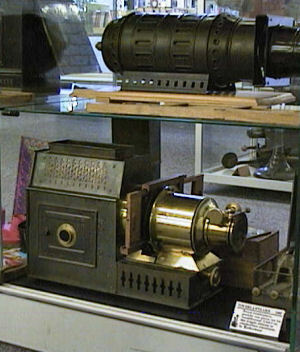 In addition, there were many Power Point presentations, in which was told about the history and use of the magic lantern. 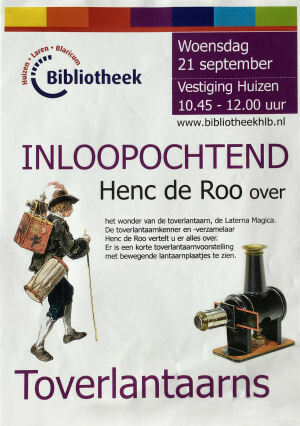 This included also a small magic lantern performance in which, among other things, it was revealed where the little children really came from.